How to Love the Neighbour as Thyself? How to Love All Humanity? More than intelligence, Love quickens talent and genius. Without Love, intelligence can do much harm. More than logic, Love assigns to reason the dignity of an unerring thought. Without Love, logic can be dangerous. More than law, Love dispenses a justice that elicits ultraneously the enthusiastic approval of Man, God and all Nature. Without Love, law can be blind and cruel. More than wisdom, Love is an all-comprehending Virtue, and spans in the extent of its phenomenon, meaning and power, both the ethical and the spiritual thought, action and achievement. There can be no real wisdom, without Love. Love is a Power for accomplishment, a Force for culture, a Sentiment that renders all life one. Love is an exalted emotion that uplifts the soul of man into a divine Awareness. More than prayer, Love unites the soul of man with God. Without Love, prayer can be less than useless, and ineffective. Love is everything. Blessed is thy heart of Love. Spread the sunshine and smiles of thy Love everywhere, in your own gentle and silent way! Extending its researches into the dynamism of the psychosomatic phenomenon, the modern Mind would one day establish as a scientific fact that as yet little-known truth, that Love sweetens saliva, kills the bad germs in the system, oxygenates the blood, purifies the whole organism. Love is the chief solvent of the several ills to which the human individual is an heir. The medicinal value and therapeutic utility of Love, cannot be exaggerated. Above all, Love is to be considered, with Saint Paul the great Apostle, as the highest technique for spiritual realisation. The Bible says, forgive. The Bible says, be charitable. The Bible says, judge not. It says, resist not evil. It says, be a peacemaker. It says, be humble. The Bible says hundreds of such things. The single element of Love in your blessed heart, contains all these hundred virtues. The grand, deep, wide, divine Love in your heart, forgives. Love is charitable. Love judges not. Love resists not evil. Love is a peacemaker. Love is humble and self-giving. Thanks to your all-encompassing and unfailing Love! It has the Bible, the Christ, and God, in it. Let its dimensions expand more, and gain for you all of the Kingdom of Heaven. He who does not love, does not know God. If a man says, I love God, and hateth his brother, he is a liar. Let us not love in word, neither in tongue, but in deed and in truth. God is Love. Therefore, religion ceases to be religion if it is not a religion of Love. Love understands, knows, illuminates, conquers and makes life eternal. Love purifies and liberates. Love is to be known and experienced by Love. Since God is Love, the way to Him is through Love. Love of God is the soul of religion. It annihilates all limitations and differentiations. It frees human perception from its errors, human heart from its mistakes, and human life from its imperfections. From the lover of God, Love streams forth equally to all beings, even as the warmth streams forth from the sun, equally to all. It is the potent remedy for curing the disease of fear, hatred, discord, unhappiness. Pure Love is an irresistible force. To him whose heart is filled with pure Love, the voice of his own conscience is the voice of God. He engages himself in alleviating the suffering of others. His is an ideal of selfless service. God's Will works through him. God's Light shines through him. God's Life expresses itself through him. Ever joyful and fearless, he brings into the life of anyone he comes across, peace, harmony, strength, happiness. The religion of pure Love is the only real foundation of the lasting unity of all humanity. With such a religion alone life becomes a song of peace, progress, perfection, and the world a Kingdom of Heaven. The best description of the Being of God is Love. Love is the soul of all Nature, and the Divinity in Man. Love is the highest Good, the highest Truth and the highest Beauty, and it unites in itself the basic processes of the three normative sciences, ethics, logic, and aesthetics. Love is the supreme virtue. It is the mainspring of all other virtues. Intellectualistic in ethics, Socrates conceives of virtue as knowledge. Seeking to improve upon the Socratic rational insight by introducing into it a volitional element, Aristotle conceives of virtue as the right-willing, the choice of the mean. Our view of virtue as Love includes, as integral to itself, the Socratic knowing, the Aristotelian willing, and exceeds and corrects them by a great comprehensiveness. An exclusive preoccupation with the art, the understanding, the advocacy and the achievement of the excellent in a merely cultural refinement, ruled out from the Hellenic ideal of character, the element of Love. Without Love we can conceive of no saint, think of no spiritual realisation, build no genuine social harmony and human unity. With Love alone there is the possibility of a deep and elemental psychic and divine experience. The first and last aim of life on earth is the obtainment of real Knowledge, Love, Peace, Happiness, higher Powers, Freedom, Immortality. But, this obtainment can be had only by one way, there is no other way: it is the way of the unfoldment of the highest divine Consciousness within us, the way of God-experience. This divine experience is possible by an increasing knowledge of the ultimate Ground of our existence, God, and an increasing love for the absolute value that Ground bears in itself. Therefore, it is the way of Knowledge and Love. We are safe only on this way. Only by Knowledge and Love, we grow. 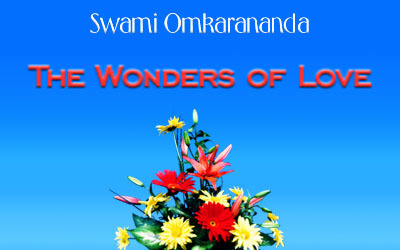 The most wonderful persons in the world are wonderful because they have love and knowledge. You too are wonderful because of your Love and Knowledge. There is none, no man, however evil, sinful and abandoned, who is not in some corner of his being, splendidly good, and, in some inmost and secret recess of his consciousness truly divine; and in his awakened hours fully aware that he had adopted wrong means to arrive at what is the legitimate right of his birth into the world, the right for Happiness, infinite Happiness, endless Happiness, for Freedom, infinite Freedom, endless Freedom, for Power, infinite Power, endless Power, for Love, infinite Love, endless Love, for Life, infinite Life, endless Life. And so long as Man is Man, however supremely good, or extremely evil, he would have moments in which he is bound to gaze on the luminous person of Jesus, or recollect calmly the sublimity and pertinence of his teaching, or derive from a thought devoted to Him, the needed inspiration. Man is a son of God and the outer shell of his evil will break. Be kind to animals; it is good. Love all; it is good. But do not get emotionally involved in anything. Emotional attachment will take away your peace of mind, will deprive you of your freedom to grow further, and will impair the sight of your reason. Therefore, found your kindness and your love first upon the Knowledge of the divine Existence and Consciousness, God, present in the inner heart of all beings. Love everything, not for small reasons which change, not for the exteriors which alter, not under circumstances which disappear, but for the sake of the Life, the Godhead, in all beings. Such a Love is the Love of wisdom, a pure Love, unfailing and never-troubled Love. Love brings and enriches love. Love does not rest content with merely loving, but flows out in acts of service. Love is delightful only when it freely gives itself. Love must be revealed in service; otherwise love has no value, such a love is no love. Love cheerfully sacrifices. Love willingly suffers. Such a love illumines and blesses life. Love for God, real devotion, is not mere emotionalism, it is the tuning of the will, the heart, and the mind to the eternal and indestructible Music of the Divine. It blossoms into Wisdom divine. It leads to God-Experience and attainment of Immortality. We are full of peace, because our inner being has its intimate relations in love with that which is infinitely peaceful, - God. We are happy, because our hearts are in tune with that which is infinite Delight - God. We are strong, because we are in constant relations with that which is omnipotent. We are wise, because our intelligence is submitted to the guidance of the all-seeing, all-knowing Consciousness of the Supreme Being. We are loving, because we experience in the inner being of all, the Presence of the all-lovable Godhead. We are energetic and hard-working, because we have the joy of dedicating all our works to the advancement of Peace, Prosperity, Knowledge, Happiness, in this good world that God made. Love God with all thy heart, and thy neighbour as thy own inner divine Self. This is the way of the Saints. This is religion. When we love God with all our heart, all our soul, all our might, day after day, day and night, for months and for years, we arrive at a stage of development where we experience God everywhere, at all times, and in all circumstances and environs. Keep company of the good, the noble and the pure. Contact the saints. Their exalted and impressive lives, and their inspiring speech, will awaken your spiritual sensibilities and the dormant love for God in your heart. Control your emotional nature, refine your intelligence, and sublimate and transform your psychological nature. Your love for God will grow. Develop your moral nature, the spirit of service and sacrifice. Your love for God will grow. Study the descriptions of the Nature of God presented by those who have had an intimate experience of God. Your love for God will grow. Do you not wish to yourself happiness, peace, success, and wellbeing? Then, wish these to everybody. Do you wish to be hurt or insulted? Then, hurt or insult no-one. Do you wish to be liked, respected and loved? Then like, respect and love others. Do you not desire freedom to do what you like in all your ways? Then, give complete freedom to others. Do you not like the full joy of living? Then, help others find the full joy of living. Do you wish someone to speak ill of you? Then, speak ill of no-one. First give to everyone just that which you wish to have from them. This is the way to love the neighbour as thyself. Higher Love is unconditioned goodwill. A will which never, under no conditions, wishes anybody harm, a will which expresses for all people, at all times, and without any compromise, peace, happiness, health and welfare - that is higher Love. It is the exalted inner perception of the union with the imperishable and all-sustaining divine Being in all that which is manifest. Close your eyes for half a minute, and wish welfare for all humanity. Generate loving and kind thoughts for all beings. Say, "May all be happy, may none on earth be unhappy". Say, "Peace to all corners of the world, and to all beings". Let there be no hatred of any kind in your heart for anyone. Wish victory to the forces of Goodness, Truth, Love, Godliness, Justice, in the world; and all those people and those nations which embody these, will prosper. This heart of all-inclusive Love, extended by a few moments of silence, prayer and contemplation, - this is universal Love. This is the way to love all beings, all over this vast world.